Acura today announced the next generation AcuraLink® cloud-based connected car system that will debut in early 2013 on the all-new 2014 Acura RLX luxury sedan. AcuraLink services are now available via new embedded technology and web-enabled devices tethered to the car, bringing a broad range of convenience, media and security features to the new flagship RLX sedan. Featuring one of the first luxury-brand OEM application of Aha™ by Harman, the next generation of AcuraLink connects drivers to thousands of personalized cloud-based news, information and media feeds from around the world, using an intuitive, audio-system based interface. In RLX models equipped with the Acura Navigation System, the new AcuraLink Real-Time Traffic™ service includes updated freeway and—for the first time—surface-street traffic, giving the RLX owner a clear picture of driving conditions, and the added efficiency of automatic rerouting to help find the quickest path to a destination. When equipped with the navigation system, the RLX’s screen can display regularly updated traffic information including traffic flow, incidents and construction on freeways and surface streets. The information is from probe traffic, a system that tracks the real-time movements of vehicles on the road to generate up-to-date flow information. The system can automatically recalculate a more efficient detour based on surface street escapes, providing improved route suggestions, when traffic congestion or road incidents are detected along the route. An Eco Route feature factors in traffic condition, incline of the road and fuel consumption data, providing a more fuel efficient route. 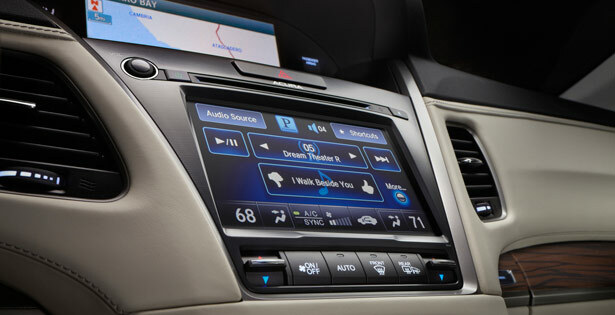 AcuraLink, Acura’s two-way vehicle data connectivity system, was first launched in 2004 in the 2005 Acura RL. The new generation of the system makes its debut in navigation-equipped trims of the 2014 Acura RLX, and will be available in three-tiers of service: the Standard Package, which is complimentary for three years, and the Connect and Premium Packages, which are subscriber-based services providing new levels of connectivity for the luxury customer. The AcuraLink Standard Package includes both embedded and tethered connected services, and comes available on the following RLX packages: RLX with Navigation, Technology, Krell and Advance grades. Embedded features include the traffic and driver messaging features. The new AcuraLink smartphone application allows owners to preset preferences on their phone. The owner can take their programmed smartphone into the new RLX and enjoy thousands of channels of personalized content accessible via audio controls, steering-wheel-mounted controls, and through a new color touch screen. With a tethered, compatible smartphone serving as a conduit to a universe of cloud-based media, AcuraLink creates a unique, connected driving experience. Through the Aha service, AcuraLink users can listen to tens of thousands of stations of streaming feeds from Twitter and Facebook, podcasts from NPR™, location-based personalized restaurant searches from Yelp, or access internet music services such as Slacker. The service is free and instantly accessible from the cloud. AcuraLink also incorporates Pandora® personalized internet radio interface and text-to-voice SMS text services with pre-programmed responses. The fee-based AcuraLink Connect Package includes all of the features in the Standard Package and incorporates an embedded cellular phone in the RLX to raise the level of convenience, emergency and security services. Automated crash notification, and an emergency “SOS” call feature via the enhanced embedded system provide added peace of mind. With a press of the overhead “Link” button, the owner can receive automated voice help with restaurant and hotel info, movie listings, flight/gate information, or have a destination sent to the RLX’s navigation system. A new in-vehicle local search feature allows the user to browse nearby information, points of interest and much more. Using the free AcuraLink mobile app on a compatible device, the owner can remotely lock and unlock their RLX, check out traffic on their electronic device, send a destination to the car or receive notification if the owner’s vehicle alarm has been triggered. The Premium Package adds a live mobile concierge service that can be contacted by a single touch of the overhead “Link” button. The live-operator concierge is available 24 hours a day, seven days a week, to provide advanced help with a destination and send it directly to the user’s navigation system, make reservations on their behalf, update the user on weather, stocks and much more.